There are thousands of providers offering VoIP these days and it can be tempting to choose the first one that offers you a great deal. However, be careful, there is more to this than simply looking at cost.We have analyzed many VoIP companies over the years and in this article we list our top 15 VoIP questions to ask before selecting a new provider. If you are looking for business phone service, you should be asking all of these VoIP questions. For residential use, where cost really tends to be the main driver, a sub-set is likely sufficient. For the purpose of this article, we have split this into 5 main sections, these being pricing structure, company background, call quality, phone numbers and service features. 1. What are the Up-Front and Recurring Costs? Make sure the quote you are given highlights all up-front costs and monthly recurring costs. The up-front costs usually incorporates the price of any hardware, such as IP phones, along with number porting fees and taxes. The monthly recurring cost is based on how many phone lines you need plus tax. Also check to see if there are any contracts as some providers lock you down to 12 or 24 month contracts. This can get you a better price but it's a long time if you become unhappy with the service or support. 2. Is there a Reasonable Usage Policy and Overage Fees? Most plans these days tend to be classed as "unlimited" calling inside the United States and Canada. However, unlimited never really means unlimited, it's a marketing game. If you read the terms and conditions you will find a reasonable use policy, which often ranges from 2000 to 5000 minutes per month, per phone line. If you go beyond this, you will most likely be charged overage fees on a per minute basis or worse, termination of your account. Overage fees are typically around 3c/minute, but could be higher for toll-free calls. 3. What are the International Calling Rates? Normally you can find International calling rates on the provider's website. Make sure you know the price of any International calls as you may be in for a shock at the cost of some destinations. Of course, this only applies if you need to make International calls. Longevity is important so ask how long they have been in business and how many customers they have. Knowing that the service has been thoroughly tested over the years by thousands of customers may give you peace of mind. However, this does not mean you should ignore new kids on the block but you certainly want to be aware of the company's history. Sometimes choosing a new provider can be a great experience as they have less demands from other customers and offer a top notch and more personal customer experience. Most of the time your service will work as advertised but you need to know the support options available to you should things go wrong. Will you have a dedicated account manager for all service related questions? What is the average response time for support tickets? Is support outsourced to another country? What are the support hours? You need answers to these questions. 6. How do you Prevent Fraud? VoIP fraud can be devastating to your business so you need to ensure that the provider has processes in place to prevent it. There are horror stories online where criminals have racked up over $100,000 worth of calls in a single weekend. Who is liable for fraudulent calls and has the provider ever experienced this? There are many ways to greatly minimize this risk such as the ability to turn off calls to International destinations and premium numbers. Secure passwords for each phone extension is another recommended step and ask the company if they can support encryption for phone provisioning and even for calls. 7. How Reliable is the Service? Reliability is a key concern, especially for business users. Find out what the typical resolution time is for phone system related issues. Also ask how many outages there have been in the previous six month period. Does the provider have redundancy in place for their PBX servers and are they geographically dispersed? Ideally the servers should be in different data centers, located in different States and have multiple backups for power and Internet. There should also be redundancy on the back-haul side, so make sure the provider has multiple voice carriers for connectivity to the Public Switched Telephone Network (PSTN). 8. Will all my Calls be High Quality? Call quality is very subjective and tends to be a function of Internet quality as much as the equipment that the VoIP company uses. 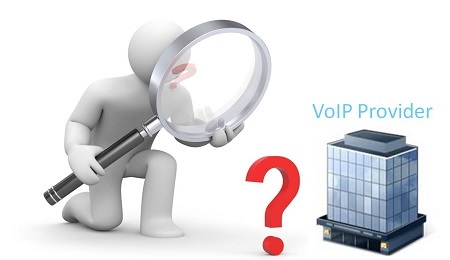 Ask the provider if they have VoIP tests to analyze the quality of your Internet before signing up for service. Also ensure they have monitoring capabilities for all calls so they can pro-actively determine quality issues. If they do not have a test, you can run our VoIP test, which analyzes speed as well as packet loss, jitter and latency. It also provides a MOS score which is a subjective measurement of voice quality. It is worth asking if the provider performs Least Cost Routing (LCR) or quality based routing for calls to the PSTN. Many use LCR which means your call routes are determined by price rather than the quality. 9. What are your Setup Recommendations? Your internal network setup is critical to the success of your VoIP calls. Ask the provider if it has recommendations when it comes to your network topology and routers they have run compliance testing on. Incorrect router settings and firewall related problems can cause havoc with your phone calls. White-listing the IP addresses of the company's PBX servers and applying QoS techniques can help ensure a trouble free system. You can learn more in our guide to VoIP router settings. 10. Can I Keep my Current Phone Numbers? Before signing up for a new service, make sure that you can port your numbers over from your current phone service. This process is referred to as a Local Number Port (LNP), though it also applies to toll-free numbers. Normally there is no issue porting numbers but there are some corner cases, especially in rural areas, so save yourself some hassle and check before going any further. Never cancel your current phone service until a successful number port has been completed. It is also worth asking if you can test the new service with a temporary telephone number first and then once happy, run a LNP. 11. Can I get a Local or Toll Free Number? If you need new telephone numbers, see what inventory is available for your local area codes and the same is true for toll-free and vanity numbers. Also see if they support virtual numbers, which is an inexpensive way to add incoming numbers to your business. It would be surprising if E911 was not supported but it's a valid question to ask. After all, VoIP handles 911 calls differently from traditional landline service so it is important that the provider explains E911 with respect to VoIP and how important it is to keep your address up to date for the E911 database. 13. What Features are Offered? Most providers offer a vast number of features. Many are standard and built into the price of your plan but some features may have a cost, for example call recording, eFax, CRM integration and more. It is also worth asking if the feature set is self-managed or if the provider will set up features on your behalf. Some providers leave you in total control for setting up features but others have a hand-holding approach to ensure things run smoothly. 14. Is BYOD and Mobility Supported? BYOD stands for "Bring Your Own Device". If you already have IP phones you likely want to keep them to save an added expense. Typically, providers will not support all IP phones so may not allow you to do a BYOD to their plan. The reason for this is that they run compliance testing for specific phone models on their system so tend to limit the number of supported phones. Tell them your phone make and model and see if they will support it. Some providers also refer to BYOD in terms of allowing any device to be used on their service, for example a cell phone. This ties in with mobility, which we will cover next. Mobility is a key discussion point. The ability to use your business phone service at work, home or on the road is an important one for most businesses. What features are available to allow mobility? One features to be aware of here is follow-me functionality that will allow multiple phones to be called when a business call comes in. Your business desk phone can ring as well as your cell phone and whichever device picks it up first gets the call. Another popular feature is to have an Application on your smartphone that acts as an extension to your phone system. You can even make outgoing calls from the App, and it uses your business Caller ID rather than your personal cell phone caller ID. 15. What Support is there for Analog Devices? Although VoIP is very much part of the digital age, we have not completely left the analog world. For this reason, make a note of any analog devices in your current setup. Examples of this are fax machines, security systems and credit card processing machines. Typically, these devices struggle when passed through as VoIP calls so you may need to either keep one analog phone line for these or look at alternatives. For fax machines, many businesses have moved to eFax solutions and indeed many VoIP companies offer this either as an add-on or included in your phone plan. Security systems can be turned into cellular based devices or Internet based if you can ensure power is always available to these devices and for your Internet connection. Credit card processing terminals can be upgraded to Internet based terminals rather than relying on an analog landline. Choosing a new phone service solely based on price can really back-fire and ultimately affect the success of your company. However, if you arm yourself with the information in this article and ask the right questions you should be able to determine which provider is the best fit for your telephony needs. If you have questions or some additional thoughts on best practices for selecting a provider, feel free to send us a comment below.